Senators began the session by passing a measure that made cuts to the budget for the current fiscal year. The reductions were a first step to offset a projected revenue shortfall of nearly $1 billion over the biennium. LB22, introduced by Speaker Jim Scheer at the request of Gov. Pete Ricketts, adjusted the state budget ending June 30, 2017. The bill made across-the-board cuts to amounts previously appropriated to state agencies, with some exceptions, lowered prior year reappropriations and made other specific reductions and increases. • added $3.5 million to the state Department of Health and Human Services to offset the loss of federal funds for certain developmental disability providers. The bill passed 42-3 on Feb. 13 and took effect immediately. The Appropriations Committee package approved later this session contained several bills comprising the $8.9 billion state budget for fiscal years 2017-18 and 2018-19. • $11.4 million for the courts in relation to the Justice Reinvestment Act. Among other reductions, the bill cut $24.7 million from state agencies, $13 million from the university system and $9 million in foster care contracts with private providers of kinship placements for state wards. • LB179, which provides for payment of claims against the state, passed 44-1. The governor returned the budget package with $56.5 million in line-item vetoes, including general funds that lawmakers had approved in the mainline budget bill for Medicaid, child welfare, behavioral health and developmental disability providers. The governor’s veto amounted to a 3 percent cut in provider rates in those four categories. The committee offered override motions on two line-item vetoes, including one that would have restored $32.4 million in provider rate cuts. The motion failed on a vote of 27-21. Thirty votes were required for adoption. 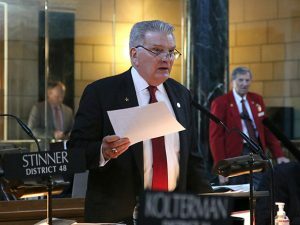 The other committee motion would have restored $300,000 vetoed from probation services within the Nebraska Supreme Court’s budget. The motion failed 23-25. • $26,800 in general funds for the state’s specialized court system. Following a vote on a second motion to override the veto of child welfare funding, which failed 19-23, all of the governor’s line-item vetoes were sustained. Among other vetoes was a $6.5 million reduction to the Highway Cash Fund appropriation contained in LB327. Ricketts said the change – along with a $15 million line-item reduction in transfers from the Roads Operations Cash Fund to the General Fund in LB331 – would prevent an increase in the state’s variable gas tax. The governor line-item vetoed $11 million in general funds appropriated in FY2018-19 in LB330 for the ongoing Capitol heating, ventilating and air conditioning system renovation project. Ricketts said the veto would not cancel or delay the project. However, action will be required in the 2018 legislative session to sustain the project schedule. Also vetoed were provisions of LB416, introduced by Omaha Sen. Tony Vargas and amended into the mainline budget bill, that would have provided $250,000 for two bilingual investigators at the state Department of Labor. No motions were offered to override those vetoes. • LB580, introduced by Omaha Sen. Mike McDonnell, which would appropriate $1 million to expand statewide the work of the violence prevention office.